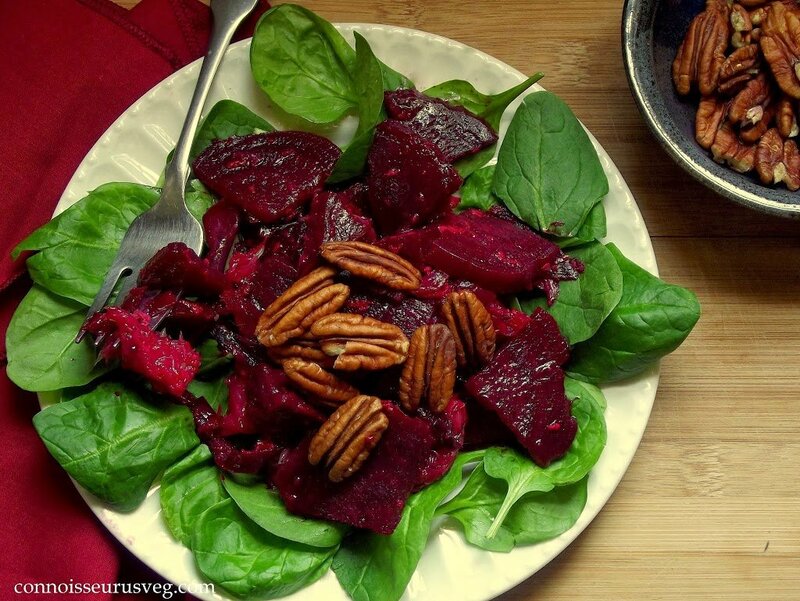 Roasted red beet salad with orange chunks and citrus dressing, topped with pecans. I recently found out that I’ve been running low on iron for a few months. Remember when I was going on about how hard it is to do yoga in the morning? Well, it turns out that the problem was more than just the early hour. In fact, I came damn near to passing out during one of my morning classes not too long ago. That was when I realized I needed to get my levels checked, and I was actually relieved to find out that I was low. It’s generally better to have a problem that can be fixed than to think I’ve just passed my peak and need to cut down on the back bends. Through diet and supplementation I’ve gotten myself to a point of feeling a lot better. In fact, I now go to my morning yoga class and want to laugh at myself of a few months ago for thinking it was the early hour that made it so difficult. Things are so much easier now. Yay! I got myself feeling better with supplements and diet, but all the while attempting to lean more in the diet direction because that’s always better, right? This recipe was part of that attempt, but was initially a bit of a goof up. You see, for a long time I was under the mistaken impression that beets were the thing to eat if you wanted lots of iron in your diet. Makes sense right? Beets are red, iron is red, we use it to make red blood cells. 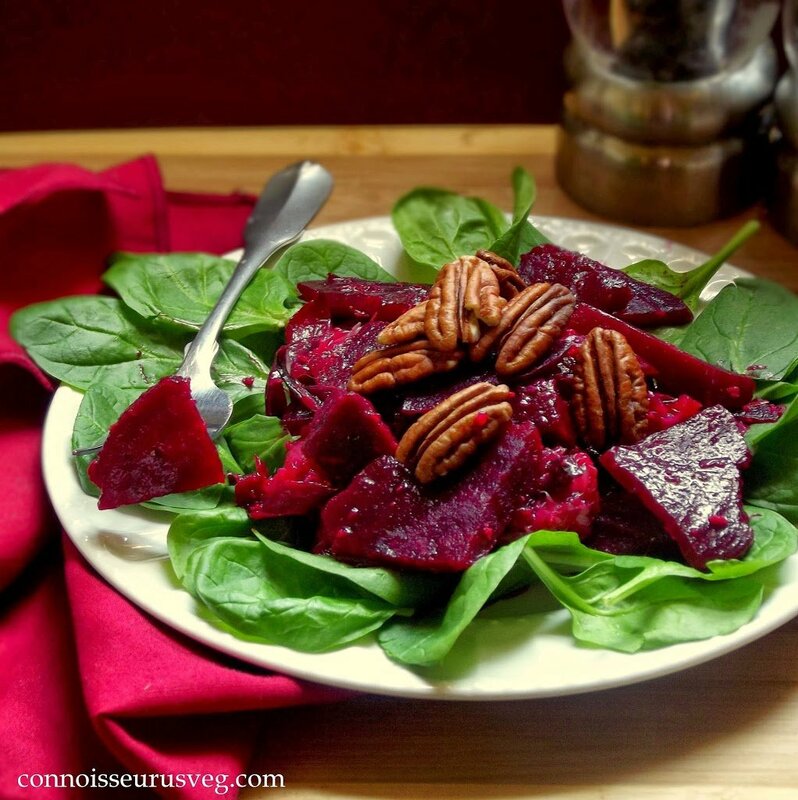 As it turns out, most of the iron found in beets is actually in the greens, which also makes sense because leafy greens are knows as good sources of iron. Here I thought I was doing a good thing and being thrifty by buying beets without the greens. What I do know is that vitamin C enhances iron absorption, so in order to save the blood enriching properties of this dish, I served it over spinach, and was pleased to find that that is exactly how it should be served. You know, for maximum deliciousness, in addition to nutritiousness. The beet portion of recipe is my version of something I used to get at the Whole Foods salad bar. I always really dug the combination of the hard wintry beets and the tangy citrus. I modified the dish over the whole foods version a bit by roasting the onions. The sweet, roasty, caramely flavor makes this more of a hearty winter pick-me-up type salad. Using one large and one small pieces of foil, make two pouches. Place beets in large pouch and onion in small pouch. Drizzle 1 tbsp. olive oil over the contents of each pouch, then close pouches up. Place in oven to bake. Remove the onion pouch after about 30 minutes (slices should be tender and very lightly browned), and allow beets to continue cooking until easily pierced with fork, about 50-60 minutes (could be more for large beets). 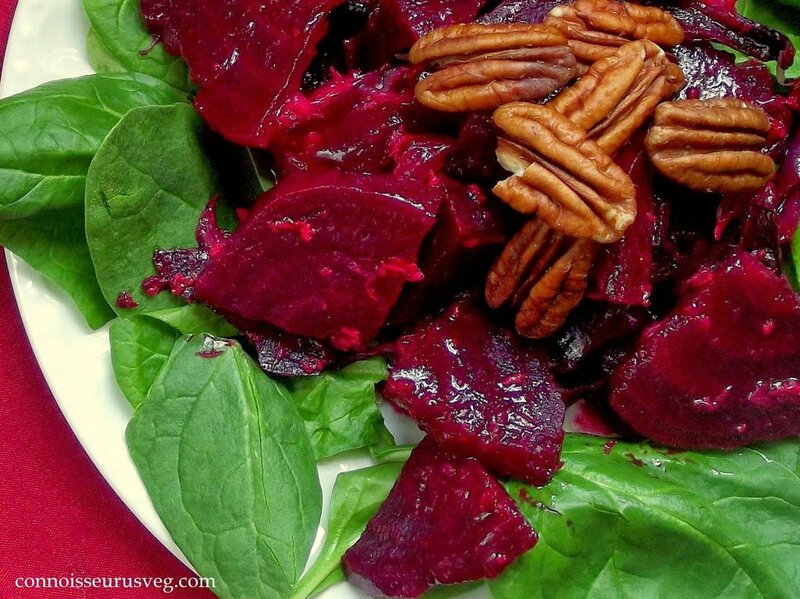 Allow beets to cool slightly, until they can be easily handled. 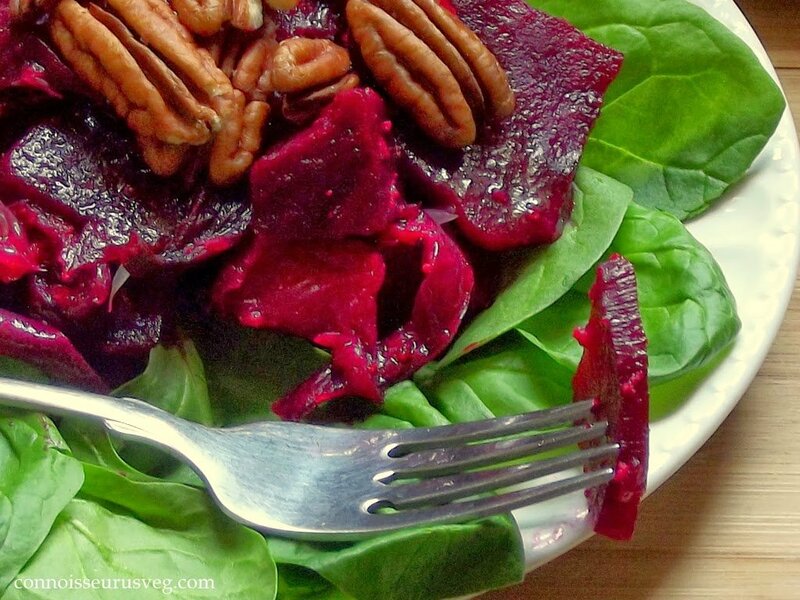 Rub beets with your fingers to remove outer layer, which should come off easily if beets are completely cooked. Slice beets and place in mixing bowl along with onions, remaining 1 tbsp. olive oil, zest, orange, juice, vinegar, maple syrup, sesame oil and salt. Mix completely and serve over spinach.